Leading up to the inauguration of Laurie L. Patton as the seventeenth president on Sunday, October 11, 2015, Special Collections & Archives will feature remarkable women from the College’s history in eight temporary exhibits spread across campus. Rhoda Mabel White can be found in Sunderland and Ross Fireplace Lounge, now through October 5th. 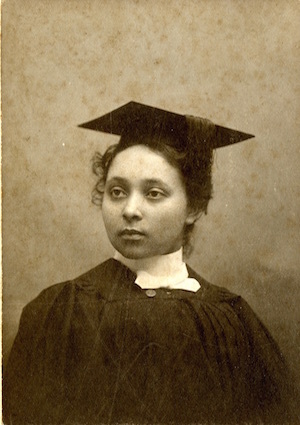 Rhoda Mabel White graduated from the University of Wisconsin in 1906. 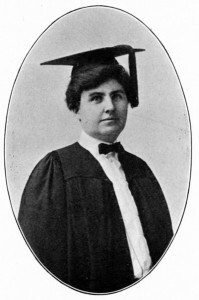 As a doctoral fellow in Sociology at the University of Wisconsin, Rhoda Mabel White became Middlebury’s first Dean of Women and simultaneously its first woman faculty member in 1909. 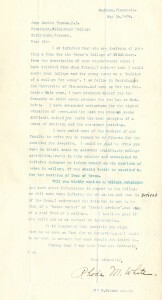 She served as Assistant Professor of Sociology and Dean of Women until 1911.
she writes, “I believe I could serve your College and its young women as a ‘builder of a College for women’.” This manifested both in her support of female students and in the physical makeup of our campus when, at the president’s invitation, White consulted with architect W. Nicholas Albertson to design the interior layout of Perasons Hall. Erected in 1911, Pearsons became the first building designed exclusively for women. 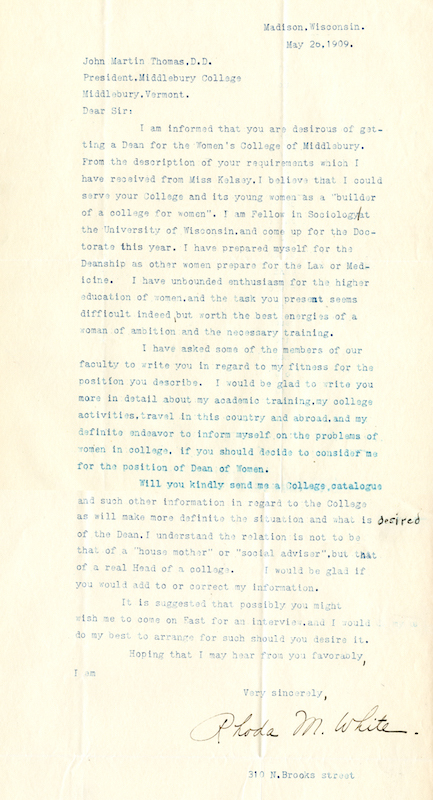 She demonstrated her self-proclaimed “unbounded enthusiasm for the higher education of women” in her contributions to the American Association of University Women, constantly striving for the advancement of women in higher education. In honor of the inauguration of Laurie L. Patton as the seventeenth president on Sunday, October 11, 2015, Special Collections & Archives will feature remarkable women from the College’s history in eight temporary exhibits spread across campus, now through October 5th. 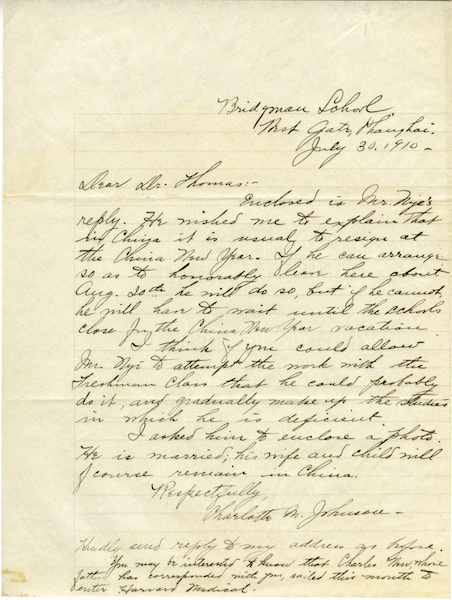 Charlotte May Johnson was born in Jacksonville, Vermont and prepared for Middlebury College at Northfield, Massachusetts Seminary. 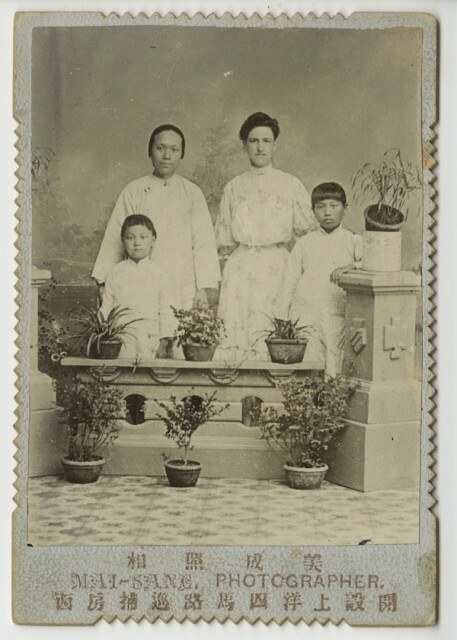 Three years after her 1901 graduation, she traveled to Shanghai, China where she became Principal of the Bridgman Memorial School and Missionary and Middlebury’s first alumna to teach as a foreign missionary. After eight years, she returned to the U.S. to give lectures on China and later settled as a teacher in Denver, Colorado. Her contributions to the College were far from just financial. Her work after graduation impacted even the makeup of the student body. While in China, she advocated for an international student who later enrolled at the College with her help and the support of President Thomas. Her ability to bridge international, cultural, and educational boundaries adds her to the ranks of outstanding women who have served Middlebury College through history. 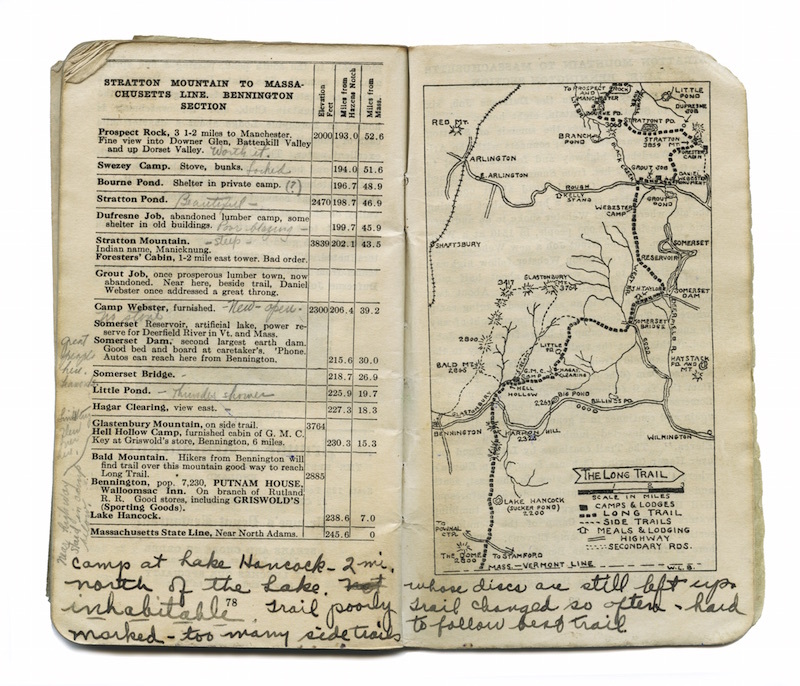 In honor of President Laurie Patton’s inauguration, Special Collections and Archives will mount a campus-wide exhibition showcasing eight exceptional women throughout the College’s history. Our community is thrilled that President Patton has joined the ranks of these founders, marking a momentous step in Middlebury College history. 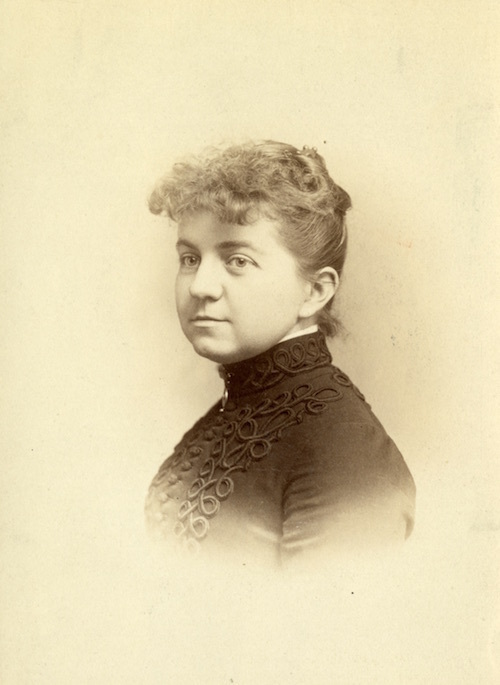 We first recognize May Belle Chellis, one of the first three women admitted to Middlebury College in 1883 and the first woman to graduate in 1886. 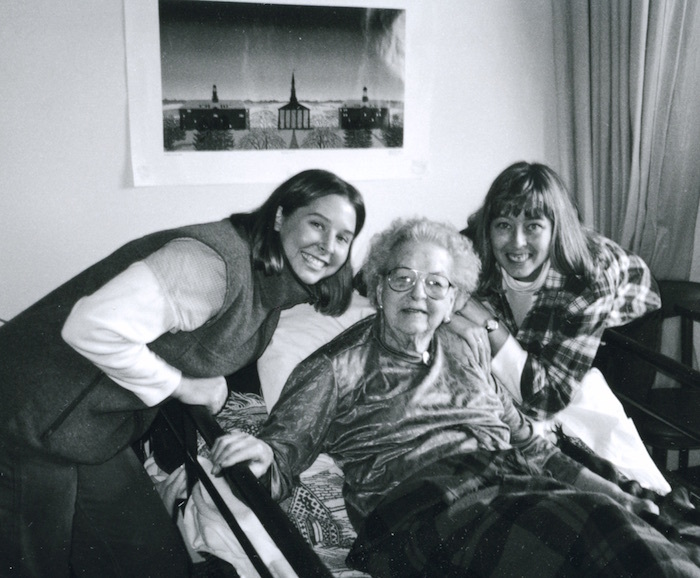 Chellis’ presence and accomplishments forced the trustees to make accommodations – including a special curriculum, dedicated study and living space, and awards for scholarship – so that women could attend the College. 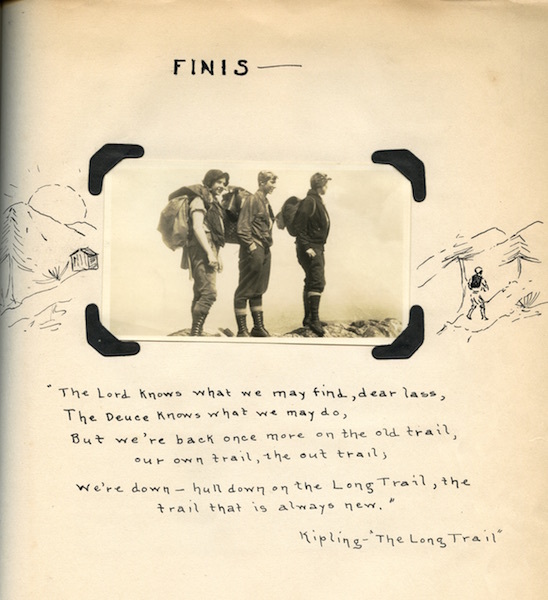 “The faculty were not going to require us to do the regular work that the boys had,” Chellis reminisces, “but [May Bolton, Class of 1887, Louise “Daisy” Edgerton, Class of 1887, and I] insisted that we ought to do it just the same.” Chellis captured the highest rank in Greek at the end of her freshman year, graduated Phi Beta Kappa, and delivered her essay “The Growth of Criticism” at the 1886 Commencement. School in Minnesota. 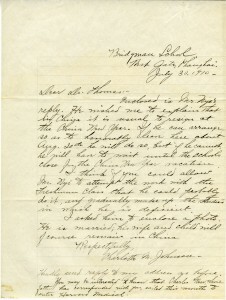 She married Joseph Andrew Doremus in 1898 and raised five children. 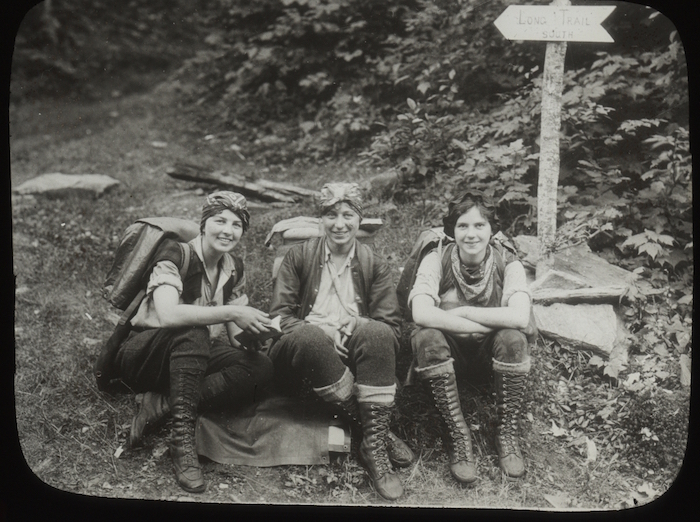 Keep an eye out for our exhibition around campus and additional posts featuring more iconic Middlebury women!